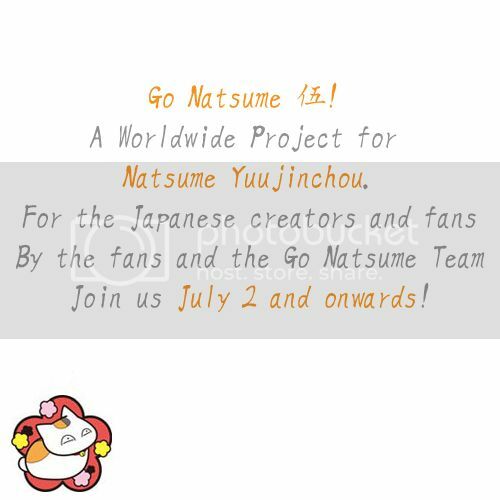 Show your support for Natsume Yuujinchou by joining our Go Natsume 伍 campaign! We deeply love Natsume Yuujinchou and want to give back some of the happiness this series has brought us. This project was born to let the Japanese creators know that we as fans would support a possible fifth anime season and to thank them for giving us such a wonderful series. and send it to us using the Submit form on the Go Natsume 伍! Website. We'll send a printed fan-compiled Yuujinchou with all the photos and messages to Midorikawa-sensei, Brain's Base and Hakusensha. But that's not all! There are a lot of other ways to get involved in this campaign even if you don't want to take a picture of yourself. Visit our site for more information and to read about the other side projects. Please help us show the Japanese creators that this is a series that has touched fans the world over! Please repost to spread the word! Go Natsume 伍! Begins July 2! Visit the Project Website and help us to spread the word! cloud_orion — Go Natsume 伍 started! cloud_orion — Go Natsume 伍! Begins July 2!